Simon de la Rouviere tweeted out a request for this project, which is based on an except from one of his articles. One of us also read Radical Markets, talked about Harberger Taxes on a recent panel in HGK, and wanted to try building a demonstration of its use case. Harberger Taxes are one way to protect the commons and increase the general welfare of society. This project demonstrates a functional use of a Harberger Tax on Ethereum to manage an array of limited assets. This implementation closely resembles - and could be reapplied to - real estate/city planning. It could be extended to other ecosystems, as well. For example, the 2018 NIFTY Ethereum Hackathon Winner currently doesn't use a Harberger Tax, but could (and probably should) as a method to achieve their mission to "protect, preserve, and restore our world’s endangered wildlife and natural zones." 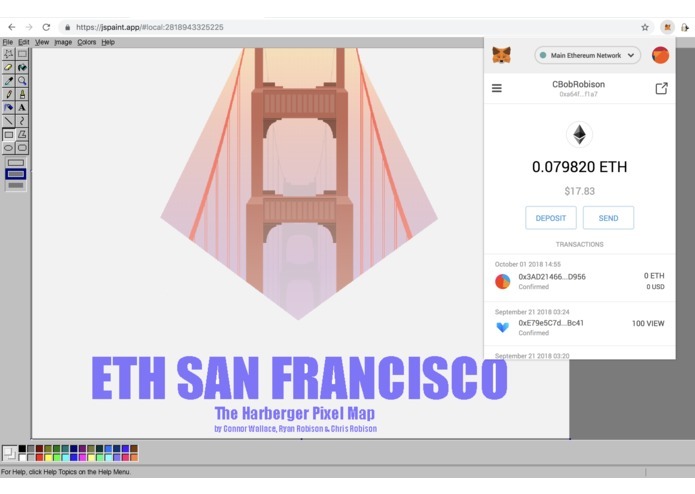 The Harberger Pixel Map allows users to set pixels on a communal canvas, similar to /r/place. Users collectively discover the fair utility value of each pixel. Values are taxed and fund the 'commons'. We've tentatively selected The Fellowship of Ethereum Magicians as the first commons project to receive funds. 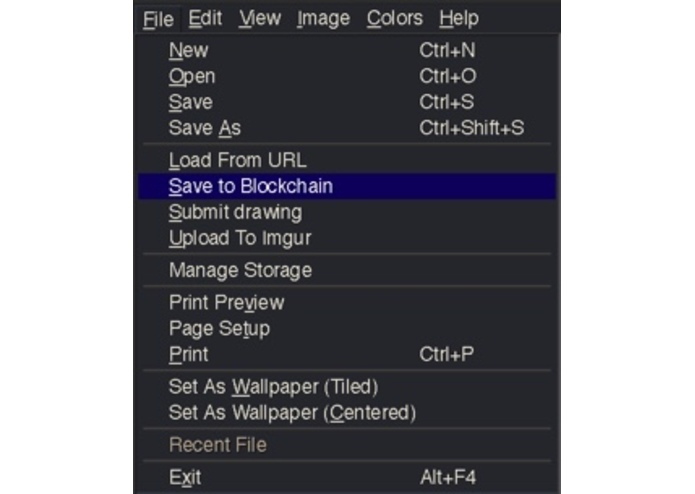 We installed web3 hooks in the Paint Clone as the user interface to compile your transaction data after you draw and color the selected pixels you wish to "purchase"
Simon suggested that the taxes could support a communal bonding curve. However, we struggled to design a justifiable bonding curve (which Simon also identified as a challenge). Instead we set the 'commons' address to the Fellowship of Ethereum Magicians. This can be updated later. 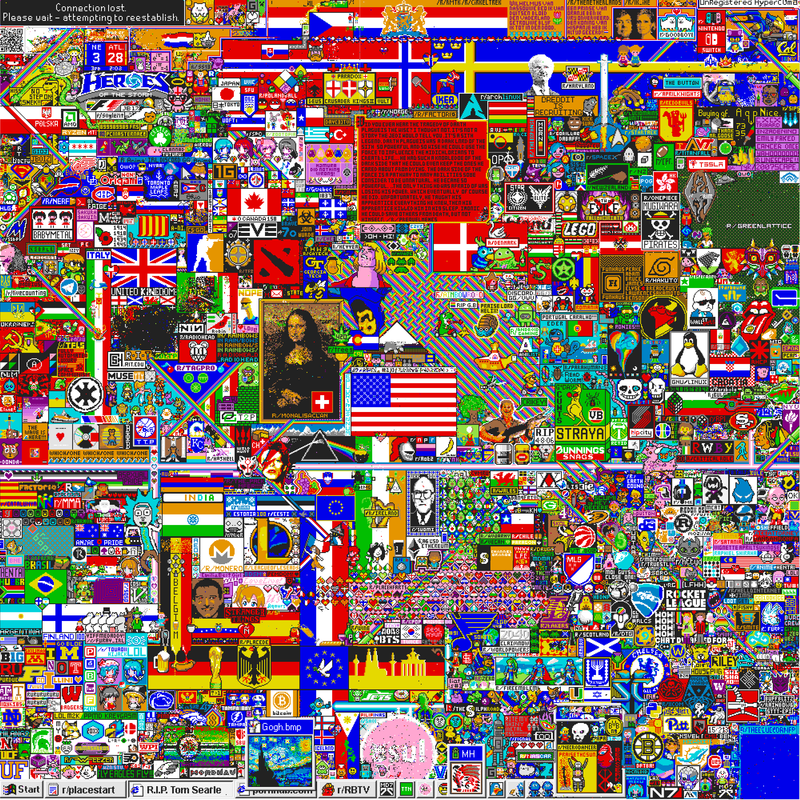 We're proud of the fact that we took a highly abstract, inaccessible concept, like a Harberger Tax, and were able to distill it into a game that most people would understand, and even recognize if they're already familiar with /r/place. 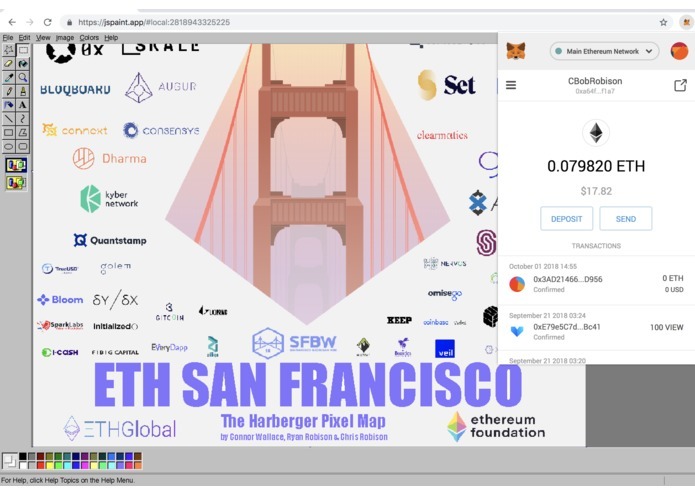 We're proud that although it might seem like the obvious solution, we independently recognized that using ERC721 as the deed per pixel would actually be quite inefficient and the wrong instrument altogether. After designing our own solution, we later corroborated this with some research done by Todd Proebsting. We designed a exit address for the Harberger Pixel Map that deposits all taxes paid to a "commons" address. For starters, we selected the Ethereum Magicians. However, we will move to build a tokenized bonding curve to decentralize the curation of "The Commons."